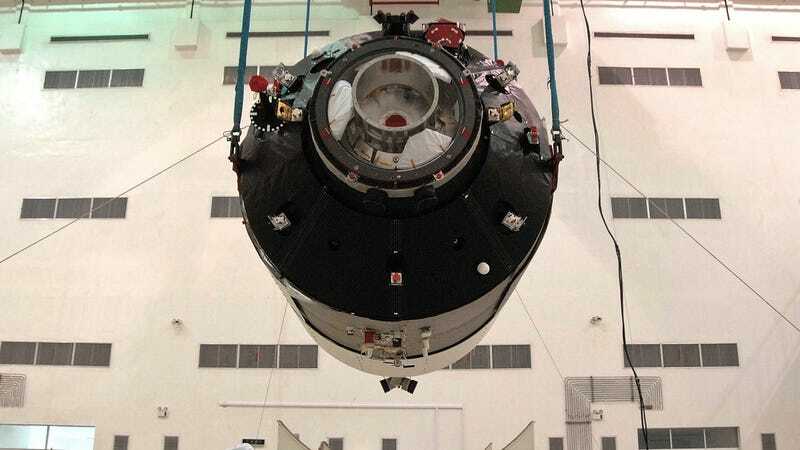 China’s defunct space station Tiangong-1 will soon plummet toward Earth, likely this weekend. You will almost certainly not be harmed in any way by it—the odds of it striking an individual person are worse than winning the lottery or being struck by lightning. You should not worry about it. But we’re humans. We’re all probably wondering, what happens if it becomes clear that pieces of the debris will strike a populated area? This is a long discussion that far predates Tiangong-1. China launched the house-sized Tiangong-1 space station in 2011. It was a prototype that could only hold a three-person crew, and the plan was for it to fall back to Earth in a controlled reentry, meaning scientists would get to pick where it lands. In 2016, China informed the UN that the satellite was no longer functioning, but denied that it lost control of the ship in some more recent reports. Tiangong-1's orbit is decaying as the craft slowly succumbs to Earth’s gravity. A 13-agency consortium including NASA and others, called the Inter-Agency Space Debris Coordination Committee, has been monitoring the craft’s reentry, while the European Agency posts updates. As of now, the estimated impact window is between March 30 and April 2. Its projected landing spans a region from 43˚N to 43˚S S latitude, a sizable percentage of the inhabited globe. Impact is more likely closer to the edges of that region, which includes nearly every major city in the United States. Again, you are much more likely to die by a million other causes than by a falling spacecraft this weekend. As the ESA writes in an FAQ: “the personal probability of being hit by a piece of debris from the Tiangong-1 is actually 10 million times smaller than the yearly chance of being hit by lightning. In the history of spaceflight, no casualties due to falling space debris have ever been confirmed.” Additionally, this debris will be relatively small compared to other uncontrolled reentries. But if the time does come that space debris threatens American livelihood, it would probably be up to the Federal Emergency Management Agency (FEMA) to make decisions. The United States Strategic Command’s Joint Space Operations Center, “provides Trajectory Impact Prediction messages concerning space debris to many locations” informs the FEMA operations centers, “which monitor the data for the FEMA Administrator,” according to FEMA’s National Warning Systems operations manual. The National Warning System “is a 24-hour continuous private line telephone system used to convey warnings to federal, state, local, tribal, and territorial government and public safety officials,” a FEMA spokesperson told Gizmodo. The organization pays closer attention to nuclear objects or those that may have poisonous fuels. Once the authorities are notified, they would use the Integrated Public Alert and Warning System to warn people in danger. Warning the right people could be difficult, though—the projected location is wildly unpredictable. As the ESA writes in the same FAQ, “Even 7 hours before the actual reentry, the uncertainty on the break-up location is a full orbital revolution—meaning plus or minus thousands of km!” The strike itself would litter debris spread over an area a hundred miles long and a few miles wide, Harvard Astrophysicist Jonathan McDowell told to Gizmodo in an email. So would a warning even be worth it? “I imagine perhaps if there was a public information plan, it would generate more hysteria than would be warranted for something so unlikely,” Ruth Rand, historian of science, technology, and the environment during the Cold War at the University of Wisconsin told me. “I imagine some people might respond with undue fear and you might have a crisis in your hands.” Instead, it might be better to just give people what information is available, and remind them not to touch any debris with their hands, as it might contain a corrosive fuel called hydrazine. This is far from the first time that a piece of space debris has descended upon our planet—and it’s definitely been worse. In 1978, a nuclear-powered Russian spy satellite called Kosmos 954 crashed into Northern Canada with little warning, scattering radioactive debris. Skylab dropped some debris in a small Australian town, and the same discussions seem to come up whenever a satellite is slated to crash into Earth, as happened in 2011 when some of NASA’s Upper Atmospheric Research Satellite (UARS) crashed into Earth. Our military has a say, too. The U.S. Air Force’s Joint Space Operations Center tracks objects 10 cm and larger in low Earth orbit and about 1 meter and larger in deep space on space-track.org. U.S. Air Force spokesperson Major Cody Chiles said, “We will continue to monitor this reentry and provide more information when it is available.” The USS Erie shot down failed spy satellite USA-193 with a missile back in 2008. All that is to say, you’ll be fine, and if you’re worried, the government actually does think about things like whether or not a satellite will harm life and property. But if you do get hit and die, take solace in the fact that you’d be the first confirmed death-by-space-debris.